Protesters barricaded roads and burned tires in parts of Chile’s capital today as a two-day national strike began against unpopular president Sebastian Pinera (sic), but mining in the world’s top copper producer was not disrupted. I had not been able to find other reports on this in the Times or in the other two main newspapers, the Independent and the Examiner, until news emerged that a 14 year old child had been shot dead by government forces. The last time Irish media attention was turned to Chile was during the long episode of the miners who were trapped in the copper mine. When that episode concluded, present Tánaiste Eamon Gilmore, who was seeking the position of Taoiseach at the time, appeared on RTE’s prime time chat show The Late Late Show. He claimed that if elected Taoiseach he would approach the economic and political crisis with the same vigour that Piñera (the billionaire Chilean president) had approached the problem of getting the miners out of the mines. There are other interesting coincidences between Chile and Ireland beyond the management style of certain members of the political class. For instance, because of past economic growth rates –largely a result of its mineral wealth, particularly copper- it became a commonplace to refer to Chile as ‘the jaguar of Latin America’. It also has a caste of politicians who make a virtue out of running the country as if it were a business, and a Minister for Education with a taste for making money out of private investments in higher education. Most reading this will be familiar with the story of Chile under Pinochet as a laboratory for the free market economics of the Chicago School after a US-backed coup against the democratically elected government of Salvador Allende. And yet the deep inequality entrenched by the Pinochet dictatorship was within Chilean society was never properly redressed, even as the Pinochet dictatorship receded and the Concertación –a coalition of centre-left parties- took over the running of the country during the past 20 years. Indeed, post-dictatorship Chile has long been a poster child for neo-liberal voices who sought to sugarcoat their ideological devotion to the market with a social democratic tinge. Chile was held up as the reasonable, measured alternative to the populist revolutionary inclinations of the Chávez government in Venezuela. 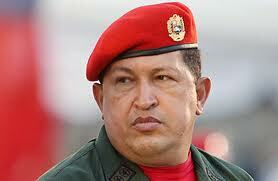 <a href=" http://www.guardian.co.uk/commentisfree/2009/aug/03/hugo-chavez-venezuela-media “>Barack Obama has robbed Chávez of his main anti-American card. Washington is calling for the return of the ousted Honduran president Manuel Zelaya and Obama is seeking to support democracy and rule of law in Latin America. President Lula in Brazil or Michelle Bachelet in Chile are trying to create a step-by-step Latina social democracy in place of the populism inherited from the Peronist tradition. These leaders seem more worthy of support from the British left than Chávez. (I should point out that Manuel Zelaya did return to Honduras, but two years later, but not as president, and only after the Obama government had done everything it could to sustain the coup government and support the laundry of the coup through elections which, as Mark Weisbrot notes here,‘most of the rest of the hemisphere, and the world, rejected as neither free nor fair’). It is interesting to revisit MacShane’s comments in light of a recent Wikileaks release from the US Ambassador in Chile, which ‘looks at ways the U.S. can counter Chavez and reassert U.S. leadership in the region’. which is hardly surprising, given that the leaders and opinion makers usually come from the ruling class and largely represent ruling class interest whereas Chávez draws his support from the broad mass of poor Venezuelans. You would wonder how on earth he managed to convince local populations devastated by IMF adjustment policies of the latter. which, as populations across Europe are now learning, is facile in the sense that ‘cigarettes are bad for you’ is also facile. Chile offers another excellent alternative to Chavez. FM Foxley seeks to integrate Chile more fully into the global economy. 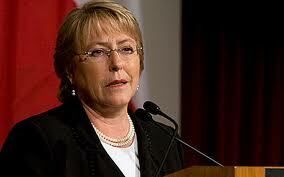 Chile has not only stated but demonstrated — e.g. Bachelet’s letter to House leader Nancy Pelosi expressing Chilean support for congressional ratification of FTAs with Peru, Colombia, and Panama — its willingness to help bring along other Latin American countries into the global economy. We should look to find other ways to give Chile the lead on important initiatives, but without making them look like they are our puppets or surrogates. This, remember, is the social democratic government of Bachelet, not the current right-wing government headed up by the billionaire Piñera, whose management style Eamon Gilmore has admired in public. This translated account by Victor de la Fuente from the Chilean edition of Le Monde Diplomatique provides the background to what is going on in Chile at the moment. It illustrates that if there is something that ought to inspire Ireland from Chilean experience, it has nothing to do with persisting with obedience to the dictates of the market or Labour Party leaders seeking to adopt the managerial style of Chilean billionaires, but with the mobilisation of a student movement against government which serves entrenched privilege and supra-national financial institutions. Hundreds of thousands of young people are demonstrating in the streets, something that has not been seen since the final years of the dictatorship. Chilean students, in three months of mass mobilisations, have changed the face of the country and placed the right-wing government of Sebastián Piñera in an uncomfortable positon. Chilean society has woken up after two decades in which it was half asleep, since it had somehow conformed to the idea that there was no alternative to neoliberalism. “Where did the exemplary “Chilean model”, the “Latin American jaguar” end up? If forty years ago, when the country was poorer, education was free, what has happened with development and the high rates of growth? Where is the money from progress?”, the young people are asking themselves. On the 28th of April, presaging the large movement that would be unleashed in June, the first national mobilisation of university students took place, from public and private campuses, against the high level of indebtedness that they must take on in order to access higher education. In May winds of change began to be felt when thirty thousand people demonstrated in Santiago, and several thousand in various cities, against the HidroAysén project, which seeks to install five mega-dams in Patagonia. The opponents reacted swiftly in defence of the environment and in condemnation of the gigantic enterprise of the multinational Endesa-Enel, linked to the Chilean group Colbún. This project, supported by the government and leaders of the right-wing parties and of the Concertación, was approved despite public opinion, thus causing widespread condemnation throughout the country. A little earlier there had been significant regional movements, such as in Magallanes against the rise in gas prices and in Calama for obtaining benefits from the production of copper in the region, as well as land reclamation and hunger strikes by the Mapuche. Then other demands emerged, the victims of the 2010 earthquake, who are spending their second winter in emergency dwellings, the copper unions who brought the mines to a halt, the demonstrations for the right to sexual diversity, but without doubt it was the secondary school and university students with mass strikes, demonstrations and school occupations, demanding free and quality education, who transformed the situation giving another dimension to the mobilisations and cornering the right-wing government. The student movement attacked the very foundations of the neoliberal system, staking a claim to the role of the State and demanding that education should not be considered a commodity. They demand an end to the education system based on profit, that the military dictatorship left behind. The most chanted slogan has been: And it will fall, it will fall, the education of Pinochet! To achieve the fundamental changes they have set out the establishment of a Constituent Assembly to elaborate a new Constitution. The students also propose that funding for free education be carried out through the renationalisation of the copper industry and tax reform. They seek the solution to the conflict by demanding more democracy, with the establishment of a plebiscite so that the citizens decide what type of education the country wants. The students condemned the official press which is criminalising the demonstrations, and they conducted tough criticisms of both 0the Piñera government and the Concertación. They took over the TV channel Chilevision, and they also occupied the headquarters of the ultra-right UDI and the Socialist Party. In parallel there is a strong rebirth of the figure of Salvador Allende, young people dressed up as the socialist president were enthusiastically applauded in the demonstrations, in which placards such as “The dreams of Allende are possible” appeared. The speeches of the martyred president, conducted more than 40 years ago, on education and the nationalisation of copper, broke records for internet hits. The student movement has been characterised by its political clarity and also for its massiveness and persistence. It has been all-encompassing, with the participation of secondary school and university students, as well as teachers, parent associations, ONGs and unions. As with other rebellions throughout the world new technologies have been widely used, but perhaps the main thing is that it has been a democratic and participative movement. The students have sought to maintain a good relation between with the activities of the leadership and the participation of the grassroots, with assemblies held where everyone gives an opinion and decides. They have shown great creativity in the form of their protests, each day they would appear in the streets with something new: costumes, dances, imitations of collective suicide, mass kissing sessions, painted naked bodies, impersonation of preachers, standing still in the street, ingenious banners…by doing this they do not merely wish to attract attention, but also to involve other sectors and to distinguish themselves from the reports of street violence. They have gone as far as to repair damage caused on the fringes of the protests, painting the walls of houses or collecting money for the owner of a car that got burnt out. If the mobilisations have been this strong it is also because of the injustice of the Chilean education model, implanted by the dictatorship and developed by the civil governments that succeeded it. In primary and secondary education, in the last three decades there was a boom in private or subsidised schools, which nowadays take in 60% of pupils. There is not a single free public university since all of them –the public as well as the private- charge high fees, the only such case in Latin America. Less than 25% of the education system is funded by the State and more than 75% of the rest depends on student payments. The State only dedicates 4.4% of GDP to education, considerably less than the 7% recommended by UNESCO. Today there are 60 universities in Chile, the majority of them private. The students must pay between 170,000 and 400,000 Chilean pesos (€250 and €600) monthly, in a country in which the minimum wage is €182,000 (less than €300) and the median salary 512,000 pesos (less than €800). 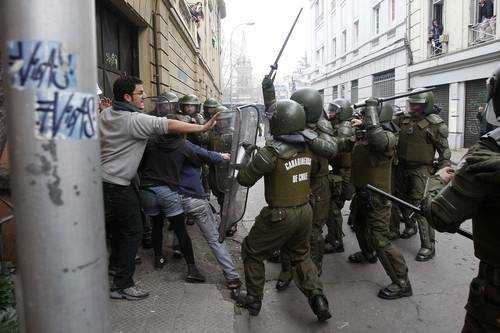 This situation means 70% of Chilean students take out student loans. 65% of the poorest quintiles stop their university degree because of economic problems. 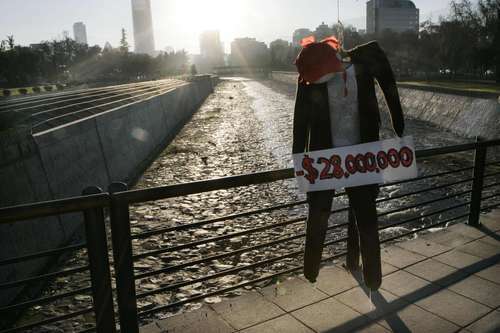 According to the sociologist Mario Garcés it is a case of a perverse system, that leaves thousands of middle and working class Chileans in debt as soon as they finish study, since student loan repayment begins with one’s first job. He adds that education stopped being a mechanism for social mobility in Chile and ended up the opposite: a system for the reproduction of inequality. It is true that there were student mobilisations during the different governments of the Concertación, including that of 2006, under the presidency of Michelle Bachelet, known as “The revolution of the penguins” (because of the dark colour of the uniform and the white shirt of the secondary school students in public colleges). However, never, in the last twenty years, were the protests so important as these. During two decades the Concertación administered the system by trying to maintain the complex balance between market policies and state regulation. It carried out some reforms, managing to lower the rates of poverty and extreme poverty, but raising inequalities, leaving Chile as one of the 15 most unequal countries on the planet. At the beginning the Concertación had the benefit of the positive image of having contributed to the end of the dictatorship, but the discontent and the criticisms from the population kept building up, along with the indebtedness of the students. The injustice of the system became flagrant with the arrival of an openly right wing government that runs the country like a business. Sebastián Piñera and the new leaders arrived with an even clearer conception of leaving education in the hands of the market, which was the last straw, moreover the young –who did not live under dictatorship- are less influenced by anti-statism. Conflicts of interest also contributed to the student rebellion since the Minister of Education himself, Joaquín Lavín was a founder and shareholder of the Universidad del Desarrollo [a private university – R]. The discredit of the political class is at a high level. All opinion surveys show a persistent drop in support for right-wing parties in government and also in support for the Concertación, currently in opposition. The young people only trust their own forces and those of the social movements, but neither in the parties nor in the institutions, rejecting the mediation of politicians and even the Church. The government, in tackling the mobilisations, has used dialogue and repression, moving more and more toward the criminalisation of the movement. The official press –that is, nearly the entire press- has emphasised the violent actions, which have taken place at the end of many demonstrations, promoted by marginal groups, some of them delinquents and infiltrators, even police, who have been denounced using videos and photos. The fourth of August past turned out to be “Black Thursday” for the government. 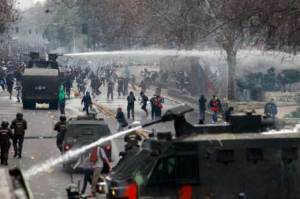 The president Sebastián Piñera said “everything has a limit” and the Minister of the Interior, Rodrigo Hinzpeter, denied the right to students to demonstrate down the Alameda [the main thoroughfare in Santiago – R], as had become customary. The repression was systematic during the whole day, and 874 students were arrested, according to official figures. The response of the citizens did not take long in coming and that very night the street demonstrations, the ‘cacerolazos’ throughout every neighbourhood and city in Chile. The government, with its intransigence, turned the march into a National Protest, as in the times of the dictatorship. 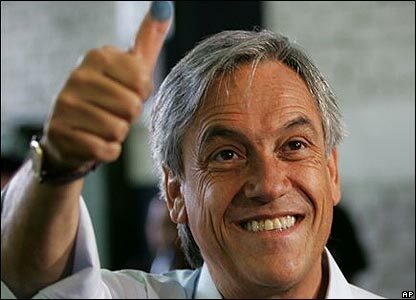 That same 4th of August the influential CEP survey gave Sebastián Piñera only 26% support, the lowest rating for a president since the return of democracy. The students persist in their mobilisations, they reject the proposals of the government to lower the loan rates and they demand a radical change of the system. They have joined the rest of the social movements, they are taking part in the National Strike on the 24th and 25th of August and they continue to seek a plebiscite so that the Chileans themselves decide democratically. In whatever way the mobilisations might continue, a new form of practising politics has been born, from the social movements. 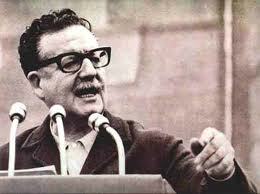 The young Chileans are opening the great avenues that Allende mentioned. I read a little about the student movement and Camila Vallejo Dowling here – http://www.commondreams.org/view/2011/08/26-0. Good point here: "She acknowledged, however, that it is very difficult to obtain structural reforms with a rightist government, saying that what they want is a long term political and educational reform in the country. "Camila has a blog here – http://camilapresidenta.blogspot.com/ Would you be able to translate more stuff if you have the time? Yes I’m going to be busy with other stuff this weekend but have a couple of things in mind for next week.